In press. Wielgosz, J., S.B. Goldberg, T.R. Kral, J. Dunne & R.J. Davidson. “Mindfulness Meditation and Psychopathology.” Annual Review of Clinical Psychology. In press. Dunne, J. “Innate Human Connectivity and Śāntideva’s Cultivation of Compassion.” In Readings of the Bodhicaryāvatāra. Edited by J. Gold and D. Duckworth. Princeton, NJ: Princeton University Press. In press. Dunne, J. “Reflexivity in Buddhist Epistemology: Implications for Cooperative Cognition.” In Dualities, Dialectics, and Paradoxes in Organizational Life. Edited by H Tsoukas. et al. Perspectives on Process Organization Studies. New York: Oxford University Press. 2016. Dunne, J. “Comments on Waking, Dreaming, Being by Evan Thompson.” Philosophy East & West. 2018. With Daniel Goleman. Ecology, Ethics and Interdependence: The Dalai Lama in Conversation with Leading Thinkers on Climate Change. Boston: Wisdom Publications. 2015. With Christian Wedemeyer and Tom Yarnall. In Vimalakīrti’s House: A Festschrift in Honor of Robert A. F. Thurman on the Occasion of his 70th Birthday. New York: The American Institute of Buddhist Studies at Columbia University. 2004. Studies in Indian and Tibetan Buddhism, T.J.F. Tillemans, Series Editor. Boston: Wisdom Publications. ISBN 086171184X. In Fall 2019, Prof. Dunne will again be teaching a course on the Science and Art of Human Flourishing. 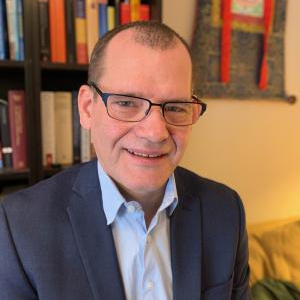 In addition to developing curricular material on flourishing and well-being, Prof. Dunne regularly teaches courses on Buddhist philosophy, mindfulness, and contemplative practice. he also teaches advanced courses in Sanskrit and Tibetan language.